This expansive canyon takes root just south of Flagstaff in the beautiful Pumphouse Wash. Oak Creek Canyon runs all the way down until it opens up at the entry of Munds Canyon from the east rim, and empties into Sedona. Oak Creek Canyon holds a myriad of side canyons, sub drainages, and a staggering amount of stone, climbing, exploration, and adventure to be had right off the heels of HWY 89 which winds its way along the canyon floor. There really is something for everyone in this canyon, starting out with the treasure of moderate traditional climbs to be found at the Oak Creek Canyon Overlook. If you are learning to place gear and get some leads under your belt, this is a fantastic area to create a foundation. Also a wonderful place to rip through them and enjoy the view for a day. Moderates hold the majority. I have moved this area to the Flagstaff Crags Section due to it's proximity to town. Though this area clearly marks the entrance from the north, into Oak Creek Canyon. If you are looking for sport routes, then you have few options. The Doctor's Office is a fully functional sport Crag with a handful of trad lines. Lower in the canyon is Muscle Beach which features creekside climbing and difficult routes. The Fire Wall is a small wall above the Anvil Boulders which holds some deceptive routes. One can also explore the depths of Pumphouse Wash for more scattered moderate sport routes. Though the sandstone is soft, there are some excellent routes to discover. Pumphouse Wash, now listed under Flagstaff Crags, is also the stunning showcase of the The Ultimates. These lines are a fabled collection of cherished, traditional routes that will test the best, up to 5.12+ fingers, and some burly offwidth if you are so inclined.... Lately some new multi pitch moderates have also been added. There is a lot to see down there, and some excellent "hot summer" swimming holes as well. The Waterfall is a columnar basalt area which now has over 130 single pitch trad routes, with the majority of them going down in the 5.10+ through 5.13 range. You can expect splitter cracks, steep jug hauls, and very thin technical lines.The climbing really starts at solid 5.10. Bring a 70M rope, a robust rack including a triple set or more of TCUs, and your game. Insomnia Canyon is a newer area found in the depths of West Fork Canyon. This area is producing long, steep, and aesthetically stimulating routes with a committing overall nature. The quality looking Coconino Sandstone is something out of a Sedona climber’s dreams and is positioned in one of Arizona’s most beautiful canyons. And, on top of all that, if you want to get in a superb sandstone bouldering session, The Anvil Boulders are a collection of wonderful and rare blocks all conveniently (or maybe not so because of the creek crossing?) located 200 yards on the East side of Oak Creek just a hop and skip drive north out of Sedona. V-easy to V-super-hard- inspiring. Some very cool steep lines. This area is in the *Northern AZ Bouldering* section. 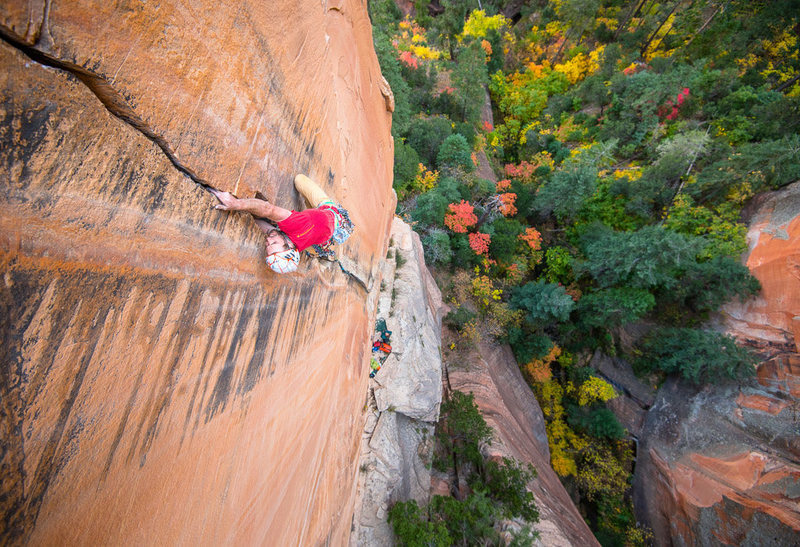 Oak Creek Canyon is a treasure to many, and a focal point to climbers in this area for harboring a wide variety of crags, which can be intimidating, but also accessible year round, if you play your cards right. It is an awesome place to visit and climb in. It can also be an arduous place to explore on or off the beaten path. Watch out for tourists, rattle snakes, rock fall, hard approaches- and mellow ones, slow drivers (with their cameras stuck outside the window), soft sandstone, hard sandstone, and impeccable stone as well! There is obviously much more to be found in this expansive canyon than is listed here. Be ready to "earn your burns". Take 89 south from Flagstaff, or north from Sedona. Sterling Pass from the air! Overview map for Oak Creek Canyon. Looking across canyon from The Waterfall. Oak Creek Canyon, AZ. March 09.